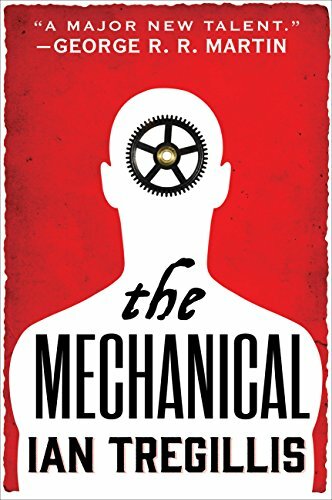 The Mechanical by Ian Tregillis (Orbit, March 10, 2015)-I was blown away with Ian Tregillis’s Something More Than Night so was wondering if he could top it with The Mechanical. I needn’t have wondered, because he did. The Mechanical takes place mostly in The Calvanist Dutch Empire of 1926, but it’s not the 1926 we know. Mechanicals, or Clakkers, have been in use for hundreds of years, given intelligence through magic, yet they’re treated as slaves. However, they are not mindless robots. Pain is used to ensure performance, but they are ultimately beholden to the government, followed close behind by their owners. If they are given geasa (orders), they must perform the task or suffer debilitating pain. New France is at war with the Dutch Empire (The Dutch Empire defeated France in the 1700s), and there are French spies that are determined to learn the secrets of the Clakkers so they may build their own. At the forefront of this spy ring is Berenice Charlotte de Mornay-Périgord, vicomtesse de Laval, and she’s made it her mission to find out what makes the Clakkers tick (literally), no matter the cost. So, Clakkers are supposed to be nothing more than robots that serve, but as I said, they’re not. The main focus is on Jax, a servitor that serves a prominent Dutch family (and their bratty young daughter.) The book opens with Jax witnessing a hanging and the destruction of a supposedly “rogue” servitor named Perch. Perch stands up to Queen Margreet until the very end, and the last words he utters are “Clockmakers lie.” This spectacle turns Jax’s world upside down, and proves very important to events to come. Also in play is Luuk Visser, a Catholic priest posing as a Protestant to spy for France, and Tuinier Alexandra Bell, who works for the Guild and is feared for her torture methods and command of the Stemwinders, fearsome Clakkers that do the Guild’s bidding. Visser is important, because he recruits Jax to smuggle a very special item across the sea to New Amsterdam, which should be easy, since his family is relocating there. Tregillis follows each of their stories and creates fully formed characters that leap off the page. Jax is my favorite, though, and when the Clakkers interact, it definitely calls to mind the way human servants of the 19th century would behave in any upper crust household (think Downton Abbey.) Their masters, thinking the Clakkers are incapable of independent thought (not even close to true), will say anything around them, and the Clakkers are able to communicate with each other using distinctive clicking sounds that humans simply think are part of their normal operation. Jax is a sensitive, compassionate, and empathic soul, and shows none of the world weariness that you would think would be his nature after 180 years. His is a life full of wonder, in spite of his status. Yes, “life”, because this book tackles the big questions concerning free will and what makes something alive, as well as the nature of the soul. The Mechanical is as good as it gets. The worldbuilding is fantastic, and Tregillis manages to build it over time and avoid the exposition that can sometimes accompany something this intricate. He trusts his readers, and that trust is well rewarded. The author combines old-fashioned adventure elements with intelligent, wonderfully plotted SFF, and gives us a hero to root for in Jax. If you only read a couple of books this year, make this one of them. ian tregillis, review, The Mechanical.